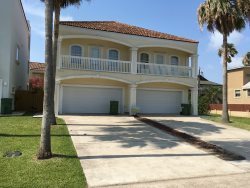 Beautiful 3 bedroom home with a private pool and close to the beach. 4/35: House of El is beautifully decorated. 6/35: Living area includes a comfy sofa sleeper. 9/35: Open concept kitchen and dining area. 13/35: Master bedroom with King Size bed. 17/35: Stairway leading to guest bedrooms. 26/35: Plenty of lighting in the pool area for your night enjoyment. Enjoy the private pool or walk ½ block to the beach. The beach access has a covered picnic area as well as restrooms for your convenience. OR, simply start your day at the beach and come home to enjoy your evening Que’ing it up at the pit. This vacation home has all the essentials. It includes garage parking, cable and internet on site. YOUNG ADULTS WELCOME with security deposit. SPRING BREAKERS WELCOME, but note, if booking for MARCH, there will be a cash security deposit added, wristbands are required, limited parking, and no extra guests or house parties. pool, sun deck with lovely patio furniture, 1 car garage available for renter use, and updated kitchen and bathrooms.